Greenwich has been constantly inventing new pizza combinations giving the public more choices based on their personal pizza palettes. Recently, I got the chance to sample two of the newest pizzas from the "Greenwich Overload" series, namely the 5-star Bacon Burger Melt Overload, and the Angus Maximus Overload. The 5-star Bacon Burger Melt Overload is overloaded with premium crispy bacon strips, beef burger, 100% mozzarella cheese and cheese drizzle. If you didn't tell me these were pizza toppings, I would think these were ingredients for a tossed salad. Saying all that in one breath alone is enough to be overwhelmed by the toppings they put together. I love the taste of this pizza. 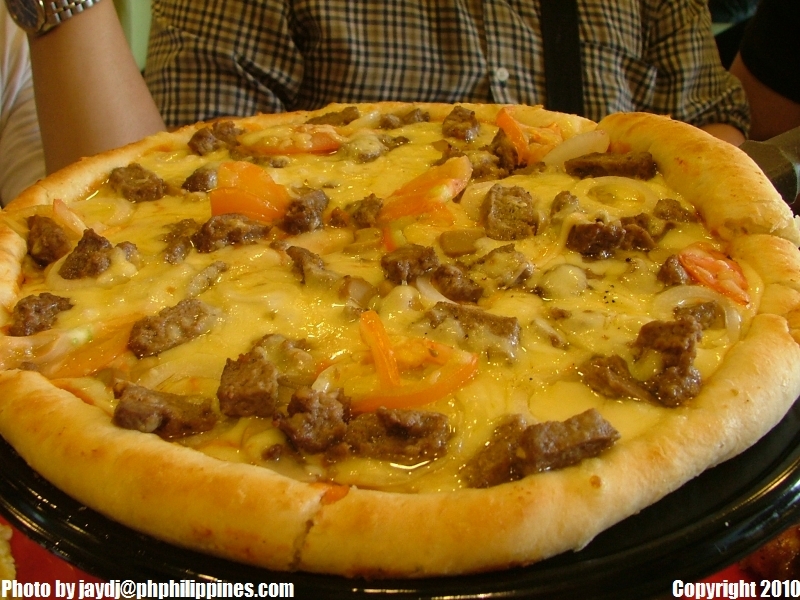 The balance of 2 meaty toppings complementing the 2 kinds of cheese provides a delectable taste in every slice. Add the overload of everything and every bite will have every topping on it. The 5-star pizza name is very justifiable. The next pizza I tasted was their Angus Maximus Overload. When I heard the name alone, I was excited to sample this unique pizza. The first thing that came into mind was "isn't angus beef expensive meat ?". Add the word "maximus" to that led me thinking I'm in for a real treat with an encounter of the angus kind. The Angus Maximus Overload is a pizza overloaded with Prime U.S. Angus beef and 100% mozzarella cheese. Never would I have imagined tasting angus beef on a pizza. 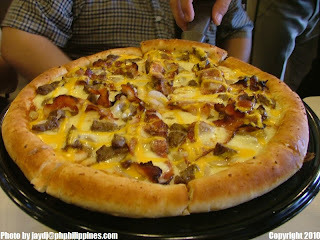 And Greenwich does this to drive the meatlovers crazy by placing it as topping to a pizza. I tell you that this massive pizza is going to make you full right away, which is a good thing altogether. At some point, you'd want to pick out a thick chunk of angus and savor its taste before going back to get a bite of angus on the pizza just to compare (but really to get a-chompin' away). Angus Maximus definitely reveals the "meatlover" in you at first bite. If you've been following the Greenwich Overload series, you'll be happy to discover that accompanying this new release is another John Lloyd commercial where he wins a best actor award. Like his "levelling up" each time, Greenwich outperforms itself with newer pizza combinations each time. I'd say that the award for best Pizza Series, goes to... the Greenwich Overload Series. Congratulations ! i wonder when they would resume their all-you-can-eat promo? OMG Chel ! I remember our Greenwich eat-all-you-can matchup years ago ! 8-all ba tayo nun ? I wonder how many na kaya natin ngayon. Rematch ? Hinahamon mo ako ? Sure ! hehehehehe! oo naman noh. hindi pwede tie yun. 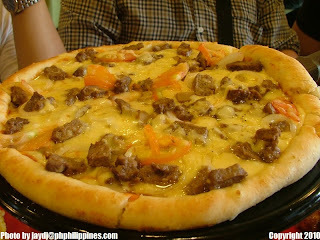 and i'll let you know, dahil sa hyperthyroid ko, i have the appetite of a construction worker. magbibilang uli si aileen. hehe. At ako naman ang audience ulit! hahaha.